This artist's illustration shows NASA's Dawn spacecraft above dwarf planet Ceres, as depicted with images from the mission. Image released July 17, 2015. NASA's Dawn spacecraft has resumed its trek to a new orbit around the dwarf planet Ceres, more than two weeks after a glitch halted the probe in its tracks. Dawn began spiraling down to its third Ceres science orbit on June 30 but experienced a problem almost immediately and went into a protective "safe mode." After an investigation, the mission team has now determined what happened and cleared Dawn to return to work. "Dawn’s engineering team switched to ion engine #2, which is mounted on a different gimbal, and conducted tests with it from July 14 to 16," the officials added. "They have confirmed that the spacecraft is ready to continue with the exploration of Ceres." The $466 million Dawn mission launched in September 2007 to study the two largest objects in the main asteroid belt between Mars and Jupiter: the 330-mile-wide (530 km) Vesta and the roughly 590-mile-wide (950 km) Ceres. Dawn orbited Vesta from July 2011 until September 2012. The spacecraft arrived at Ceres this past March, in the process becoming the first probe ever to orbit a dwarf planet, as well as the first to circle two celestial objects beyond the Earth-moon system. Vesta and Ceres are building blocks left over from the age of planet formation, so Dawn's observations should help researchers better understand how rocky worlds like Earth and Mars were put together, mission team members have said. The spacecraft's work at Ceres has already brought that pockmarked world into much sharper focus, revealing intriguing features such as unexplained bright spots in the floors of some craters. 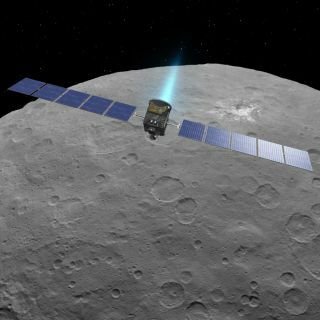 The third science orbit will not be Dawn's last; later in the mission, the spacecraft is scheduled to study Ceres from a distance of just 230 miles (375 km). Dawn will stay in this fourth science orbit through the end of its mission, in June 2016.